I've associated flying whales with music for a long time. I'd say that this has everything to do with the second sequence in Fantasia 2000, in which a family of whales takes to the air accompanied by Respighi's The Pines of Rome. What sounds like a goofy idea on paper becomes uniquely beautiful onscreen—the improbable soaring of those giant animals becomes strange and moving, and it's all accompanied by the surging triumphalism of the orchestra. ustwo's Whale Trail also relies on music, though its music of a somewhat different sort. The game's theme song is a melody called, I would assume, "Whale Trail," composed by Gruff Rhys of Super Furry Animals fame. It moseys amiably along, a sort of Beatles-meets-XTC kind of soft, borderline-ironic psychedelia. Gameplay itself is in the Cannabalt/Jetpack Joyride camp, in that each game sets your character flying from left to right and its up to you to use the game's tools of navigation to dodge various traps and pick up as many power-ups as possible. The protagonist, Willow the Whale, can fly—he must stay above the clouds at all times, grabbing floating colored balls and dodging mean rainclouds. If you drop below the clouds at the bottom of the screen, you die and must start again; if you hit too many rainclouds, you also get a game over. Scattered throughout the colored balls are power-up stars, and if you grab enough of them, Willow becomes temporarily invincible and gains the ability to blast through rainclouds. Willow moves in a looping, swinging fashion—touching the screen causes him to ramp up and eventually do a midair backflip. As a result, the game feels more like a curlicue than the straight-line jumping of Cannabalt or the constant ramping and diving of Jetpack Joyride. It's a substantial difference in gameplay, and enough to set Whale Trail apart from its competition. But it's the game's vibe that really sets it apart. 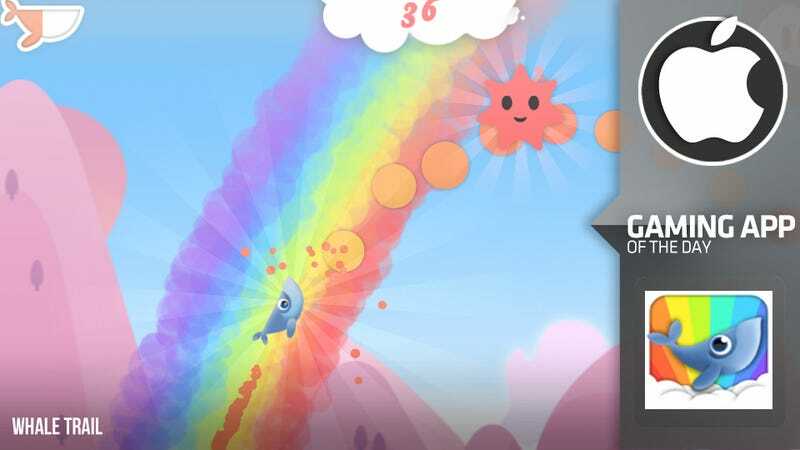 As you can see from the screenshot above, Whale Trail is a bright, colorful experience—more "fun!" psychedelic than "Get the bugs off of me!" psychedelic. If anything, its most reminiscent of Adult Swim's spectacular Robot Unicorn Attack, right down to the cheeky pop music. Rhys' theme song plonks along, and Willow himself often chimes in with how totally groovy things are. Do a backflip and he'll often say, in a bemused half-sing, "I can see my house from here!" It's all pretty dang cute, and lends the game an entirely different tone than the driving electro rock or muscle-jazz of its app-store contemporaries. All in all, Whale Tale is a charming and colorful score-chasing time-waster. Its aggressive cheerfulness may grate over time, but for the short-term, it's a fresh and goofy take on the "Go from left to right and don't die" game.